Taken during the ascent of the South Sister in the Three Sisters Wilderness. Taken during the ascent of the South Sister in the Three Sisters Wilderness. Fires in the area made for surreal sumitting experience since all the smoke had settled in the valleys. Edited with Topaz Texture Effects to give it the vintage/timeless feel. On the largest of the 3 Green Lakes, there is this cove that seems to have been made to perfectly frame this reflection. at the right time of day. Taken from our campsite in Park Meadow. With Sierra at Tahoe and Kirkwood ski resorts off in the distance. Taken from the ridge along the PCT just north of Carson Pass. Taken from the PCT, just north of Carson Pass. There is still so much snow left for July1! What a winter it was in the Sierras in 2017. The PCT looking South with Round Top peeking up over the horizon. Taken in Meiss Meadow near the junction of the TRT and the PCT. Taken in Meiss Meadow near the junction of the TRT and the PCT. This version was edited with Topaz Texture Effects. Taken just north of Carson Pass along the PCT where it joins up with the TRT. With an airplane flyby during the long exposure photo. Taken at the southern end of Rubicon Reservoir in Desolation Wilderness. My tent is a Zpacks Duplex. I love how it's almost see through for a more open feeling. Taken during a backpacking trip from Loon Lake to Rubicon Reservoir. 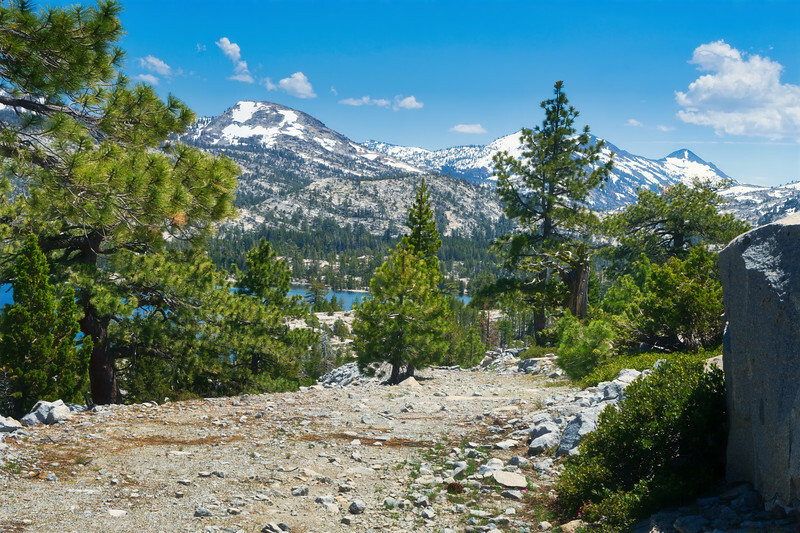 This is a great early season trip for when the rest of Desolation Wilderness is still covered in snow.